Tudor and the French Navy: a love story? Rolex did not have the same commercial success with the Tudor Submariner as with its parents, the Rolex 5512 and 5513 Submariners. Tudors were sold at a fraction of the 5513 price and so it was not difficult for the French Navy (La Marine Nationale) to negotiate a good deal for significant number of pieces. Unlike contracts for the U.S. and British Royal Navy, which specified all the characteristics of timepieces from size to materials, the French government contracts were purely commercial contracts. Therefore, the Marine Nationale (or M.N.) provided its divers with many different watches including Zenith, Doxa, Longines, Rolex, Blancpain, Beuchat, Auricoste and many others. But that's another story. Early on, the French Navy equipped its divers (plongeurs de bord) with Tudor Submariners. The first Tudors were purchased by the M.N. in the late 60's. This model seemed to meet army specifications for Commando Marines. 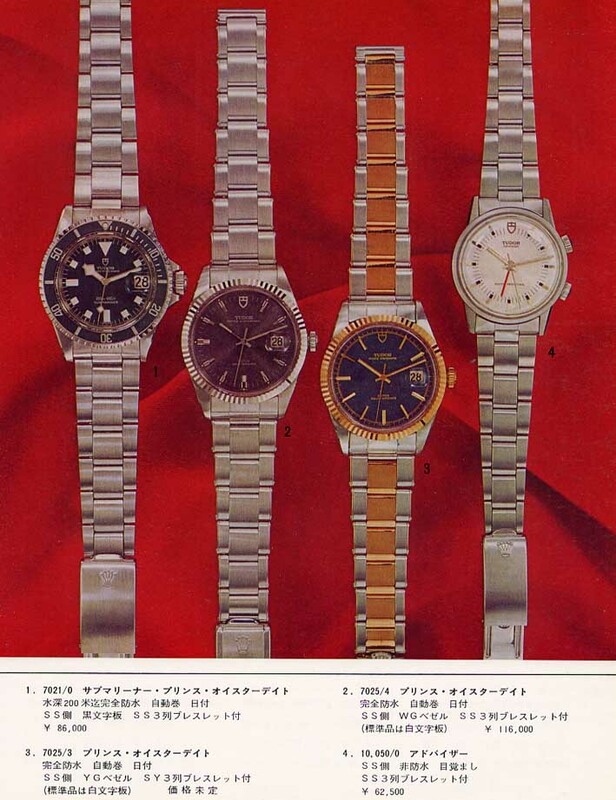 It was then the classic "rose" model, (see right) featuring case reference 7928 and the Rolex-derived 390 movement. Curiously, this model had the same sharp crown shoulders as the first Rolex 5512. The back is prominent and flat (unlike the bubble-back-like of that of further models). These models do not hack, but backwards action will stop the movement. Ironically, the same model was issued by the U.S. Navy to their UDT and Navy SEALS (see Marvin Whitney's Military Timepieces for more details). Like their american cousins, the M.N. Tudors were always issued "head only." The absence of any sign of wear between lugs that a metal bracelet might have produced is a good clue for purists. In 1974, the M.N. 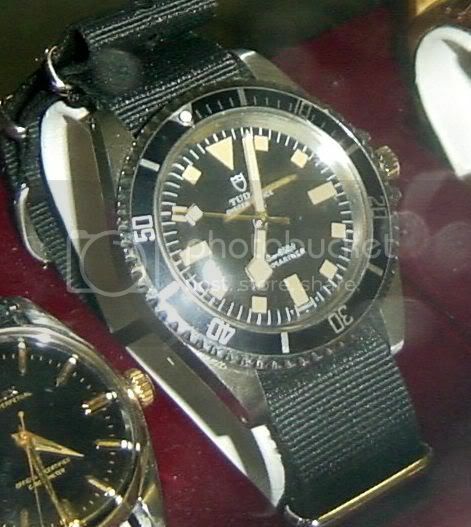 started to extensively equip their commando marines with Tudor submariners. From this point, most of the watches (except a few, for some "sterile" reasons) are marked on the back MN 19xx or MNxx. This date -1974- is very important from a collector's point of view. This transitional model (case reference 7016/0) always has a black dial and "square" or "diamond hands" (see below) The case back is slightly different from subsequent models in that it retains somewhat of a "bubble back" look. The movement is now an ETA 2483, non-hack, no longer found on the earlier models. Of course, the rose is no longer the Tudor emblem, replaced in the late 60's by the current shield. The poor quality of the dial coating and its vulnerability to moisture led Rolex to propose another dial. Starting in 1975 dials with a blue finish were introduced which had much better tolerability to water. These dials had square then "Mercedes" style markers and hands (see images to the right.) These blue dials proved to be an excellent choice in that the dials were coated with an enameled material which prevents ageing. I have seen (and own) many mercedes-ed Tudors, with ruined cases, faded bezels, brownish hands. The dial was always intact ! The case reference is now 9401/0 or 94010, and the movement is the current ETA. I don't know of any model issued after 1983. Most of The Tudor submariners were auctioned by the army, according to their date of end of service. Some of them are being (as I type this...) destroyed manually by some troopers in Toulon or Brest...I have tried to save some and share with you this piece of the French Naval history. The French Navy, La Marine Nationale, has a long lasting history of using the Tudor and Rolex submariner models. Indeed, the M.N. official diving equipment supplier, La Spirotechnique, signed a succession of commercial contracts with the Swiss watchmaker from the late 60's till the mid 80's. The Tudor submariners were supplied to the French Navy's picked divers such as the Clearance Divers (Plongeurs Démineurs), the Combat Divers (Commandos Marine), and a few selected Ship Divers (Plongeurs de Bord). Being a Ship Diver was then a part-time activity or secondary duty for sailors onboard. In addition to the elite personnel mentioned above, a handful of Combat Diver officers serving in the C.I.N.C. 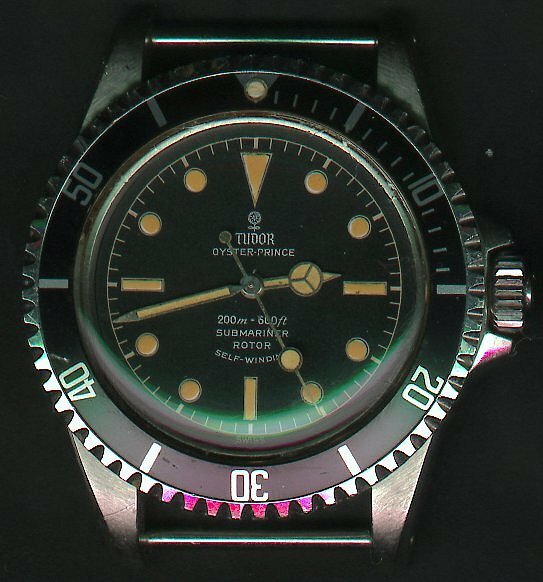 (secret service operational team based on the outer island of Cosica in the Mediterranean sea) were equipped with the famous Rolex submariner 5513.
not "issued", Tudor has a long history with the French Navy. Thanks to Zaf for this one. US Navy divers, case # 7928, Rolex-derived cal 390, rose logo on dial. Gilt markers. Marked USN 0152 on back. See Marvin Whitney's "Military timepieces" page 585 for more details. QUESTION: when is a Rolex not a Rolex? Answer: when it’s a Tudor. Rolex have been making watches with the Tudor name on them for many decades, using Rolex cases, bracelets, dials, hands, crystals and crowns—in fact, Rolex everything—except the movements. Admittedly, in the very early days (the 1940s and 50s) Rolex did fit Rolex movements into their 'cheaper line'. 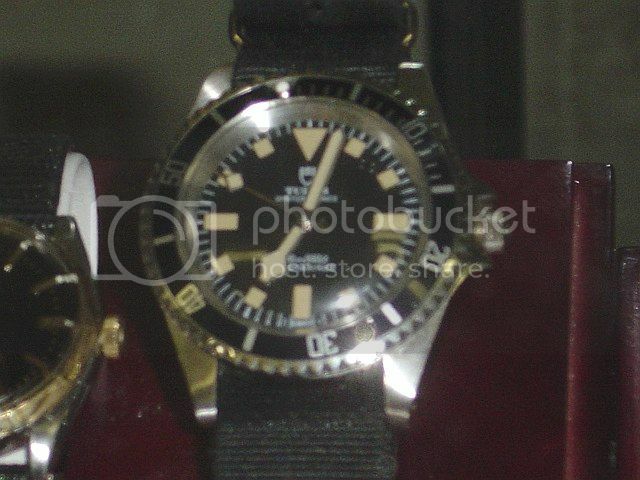 As a case in point, the early Tudor Submariners were fitted with the Rolex cal.390 movement. However, later Tudors use what are essentially standard (but high grade) ETA movements with little modification. They may not be as robust as the modern in-house Rolex movements, but they’ve been around a long time and have proved themselves to be accurate and reliable. And, of course, cheaper. I spotted this little beauty whilst waiting in my local watch repairer’s while he fitted a new battery into my Omega Speedsonic. He has a cabinet of odds and sods for sale, some quite desirable, others not so. This one was on consignment. I asked to see it, and of course, once it was in my hands and ticking, I was sold. I casually gave it back, said I would think about it, and would call back if interested (just call me Mr Cool). He smiled a knowing smile. Don't forget, I had bought the Speedsonic from him. Naturally I called in a couple of days later, bargained a bit, and the Sub was mine. Now, you have to realise that this style of watch is a complete departure for me. I mean, all it does is tell the time, for crying out loud. No date, no chronograph dials, no alarm, no countdown timer, no slide rule, no automatic time zone setting hands à la Navihawk—just a purpley-grey rotating bezel, and those magic letters "200m=660 ft" on the dial. Oh, I’ve got watches that are 10bar (100m) water resist, and I’ve even had a swim wearing them (no problems), but I’ve always hankered after a real water resistant watch. You know, for all those days when you might unexpectedly find yourself cast overboard from an ocean liner or something. Knowing the correct time then could be very important, such as being able to estimate how long it will be before hypothermia sets in………but I digress. My man said it needed a service; the balance amplitude was down, the case and crystal (acrylic) needed a polish, and the last service date scratched inside the caseback was 1986. He subsequently discovered a worn ratchet wheel in the auto-wind mechanism and replaced it. Dating my Sub to 1968 (it didn't come with the original papers) was a matter of some simple detective work. 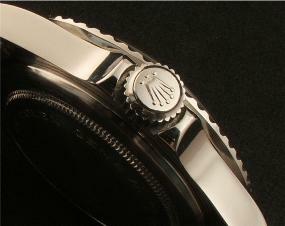 Stamped inside the caseback and on the bracelet are the symbols I.68 (Roman I, Arabic 68 ). In Rolex parlance this indicates the first quarter of 1968. 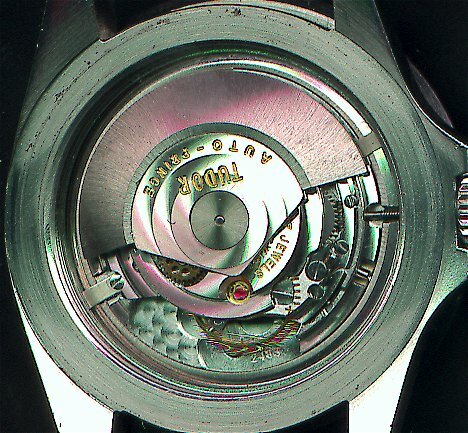 An additional piece of evidence is that according to an authoritative source (Automatic Wrist Watches from Switzerland by Heinz Hampel), the ETA 2483 movement inside my watch was not fitted into the Tudor Sub until 1967. 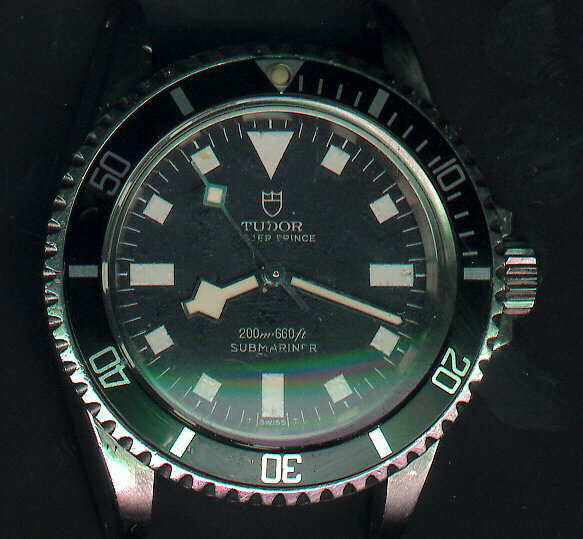 Another reliable source (fellow Australian Paul Delury, known on TimeZone as Gumby) tells me that on the Tudor Oysters the rose emblem on the dial was superseded by the shield in the mid-60s; however, he wasn’t sure this also applied to the Subs—it could have been a bit later. 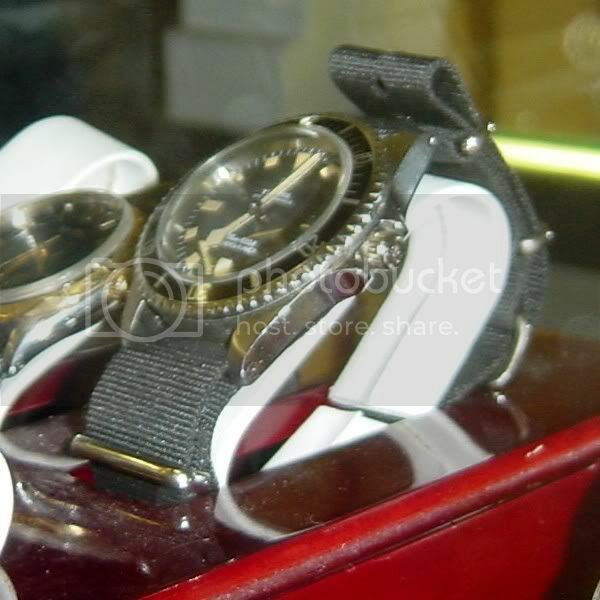 Rolex apparently didn’t keep manufacturing records for its Tudor line (strange! ), so we may never know for sure. 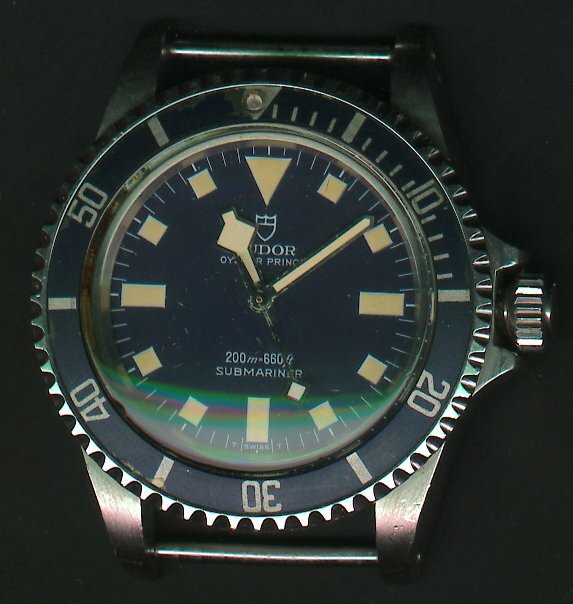 The hands and hour markers are tritiumed and must have been dazzling when new, for they still shine brightly after exposure to strong light but quickly fade until only the hands (all 3 of them) and the 'pearl' on the bezel give off a very faint glow. The minute markers are very accurately positioned, because once the second and minute hands are coordinated, they maintain an exact relationship at any part of the dial. In other words, at anywhere on the dial, the minute hand points exactly to the minute marker as the second hand passes the 12 o’clock position. I like that in a watch. Legibility of the uncluttered dial is outstanding—even without my glasses. Definitely a plus for the long-sighted! And then there’s the bracelet. Ahh, the (in)famous Rolex oyster bracelet! This one, being an earlier model (the 7206), has thin folded links with a brushed finish on the outside and polished on the inside. However, the outer links have polished endplates rivetted onto them, giving the appearance of solidity. It feels somewhat light and even flimsy compared to later, thicker and heavier bracelets I have worn. It has those horrible, tinny, pressed metal endpieces that go ‘tchink’ when you move your arm. It’s a hair puller. It doesn’t have a flip lock or wet suit extension. It took me 2 days of fiddling with the adjustment pin in the clasp to get it to feel anywhere near right (luckily there's plenty of adjustment holes). And yet, and yet……….it looks good. I especially like the look of the clasp, with its Rolex crown opener. The clasp hasn’t opened unexpectedly on me…..yet. (I know, Sod’s law says it will happen at the most inconvenient time, like when I’m waving from the top of the Eiffel tower to people on the ground.) It’s beginning to feel almost comfortable. And as for being light, well, you get used to it. With all 12 links in it fits my 7½" (19cm) wrist OK. I may even end up liking it (apart from the endpieces). It’s early days yet, and no doubt it’s still settling in after the service, but the Tudor is currently running at a consistent +10 secs/day. That’s with being worn during the day and left dial up at night. Hopefully, the consistency of the gain means that some judicious regulation will improve the accuracy, although it must be remembered that this is not a chronometer rated movement. The movement does not hack (i.e. it doesn't stop when you pull out the crown), but for accurate time setting you can stop it by applying backwards pressure on the crown when in the fully extended position. This is easier to accomplish when the mainspring is nearly unwound. When it's fully wound, the movement is very reluctant indeed to stop! After an initial full winding when I first got it 6 days ago, I haven’t touched the crown. The crown itself is delightfully smooth and positive to screw and unscrew, as is winding the mainspring with it. The crown carries the Rolex symbol only, so is of the 'Twinlock' type. (The improved 'Triplock' sealing system is indicated by the addition of three dots under the Rolex crown symbol.) I don’t know what the power reserve is—probably in the range of 38-42 hours, which seems common for this type of movement. I haven’t tried wearing the watch in water yet. Tudor Oyster Prince Submariner, model no. 7016/0. Signed on dial, crown, caseback, movement, bracelet and clasp. Movement: ETA 2483 25-jewel bi-directional rotor automatic; 18,000 bph (2.5Hz); Glucydur balance; incabloc shock protection. Modification/embellishment - minimal; some perlage evident. Centre sweep seconds hand. Non-hacking but backwards pressure will cause movement to stop (eventually!). Case: Stainless steel, all polished except for brushed finish to tops of and between lugs; screw back signed "Original Oyster Case by Rolex Geneva"; water resistant to 200m/660ft; 'Mercedes'-style hands; weight incl. steel bracelet approx. 90g; 39.5mm Ø across bezel excl. crown; 20mm between lugs; 47.5mm across lugs; 13.5mm overall thickness. Tritium paint on hands and hour markers. Crown: 7mm Ø screwdown Twinlock signed with Rolex crown symbol. Bracelet: Stainless steel 12-link rivetted oyster, non-flip lock deployant clasp with Rolex crown symbol as opener. The Tudor Submariner is like a Mercedes with a Ford engine. The external parts are solid, tried and tested, and immediately recognisable. The internals are also dependable and efficient, but somehow don’t have the same aura or cachet of the luxury brand. This is fortunate for the collector of the unusual, for it means that with the Tudor Submariner, a quality product can be had for relatively little outlay compared to its more famous sibling—although I note that prices for vintage Tudors are rising as good ones become rarer. To carry the car analogy a bit further, fixing the motor is cheaper too, should anything go wrong. I prefer the more discreet appearance of the Tudor Sub compared to its Rolex brother, with its ‘vintage’ aged dial (somewhat like myself), and am delighted with the performance so far from this 30-year old timekeeper. And it’ll never need a battery! Now, where did I put my snorkel and flippers…..? - Pendant 30 ans en france il y a la garantie légale (résponsablité civile)contre les vice caché donc contre une contrefaçon. - Les Papiers et la boite sont importante pour la valeur de la montre cepanadant il exsite des contrefaçons ou des rachatas d'occasions. - Ne pas oublier vus la somme dedemander une lettre de cession du vendeur avec une copie de sa pièce d'identité (id) particuliérement s'il n'y a plus les papiers de la montre. 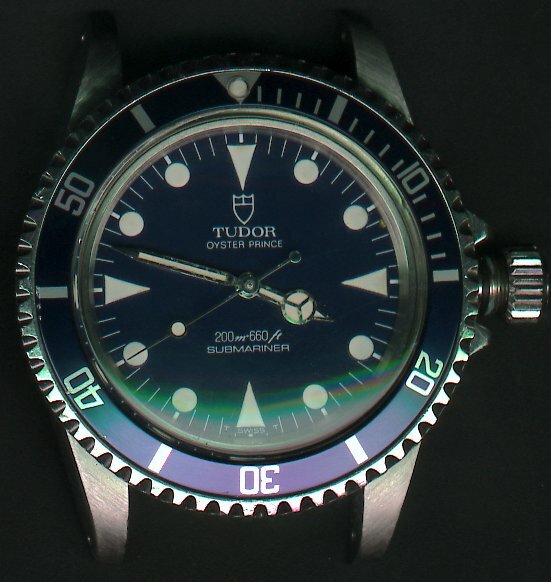 Tudor Oyster-Prince, "Submariner", 200m/660ft, Rotor Self-winding, Ref. 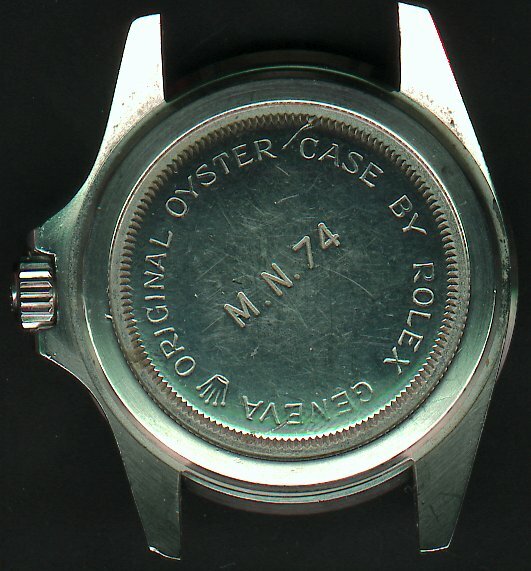 7928, case made by Rolex, Geneva. Produced in the 1960's.Fine center-seconds, self-winding, water-resistant, stainless steel gentleman's wristwatch. C. three-body, polished and brushed, screwed-down case back and crown, graduated revolving black bezel for the decompression times, "Twinlock" winding-crown protected by the "Crown Guard". D. black with tritium-coated round, triangular and bâton indexes. "Skeleton" tritium-coated hands. M. Cal. T 390, rhodium-plated, 17 jewels, straight line lever escapement, monometallic balance, flat balance-spring.Dial, case and movement signed.Diam. 40 mm. TUDOR “ PRINCE DATE SUBMARINER”MONTRE BRACELET d’homme en acier, cadran bleu avec index et lunette tournante émaillée graduée. Mouvement automatique. Bracelet acier, maillons oyster avec boucle déployante en acier, signée . TUDOR “ PRINCE OYSTERDATE SUBMARINER” MONTRE BRACELET d’homme en acier, cadran bleu avec index, affichage de la date par guichet à 3 heures, lunette tournante émaillée graduée. Mouvement automatique. Bracelet acier, maillons oyster avec boucle déployante en acier, signée. Pour les Marine National : vus le gravage toute personne sachant graver peut faire ces marquages : donc méfiance et prudance. Attention certaine tudor sont de vrais salade au niveua du cadrant suite au passage au SAV particuliérement au niveau du cadrant et aiguille. resistance rating of 200 meters. The automatic movement is a ETA cal. 2784. » Tudor Submariner, de quoi se méfier?